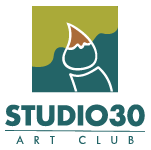 Studio 30 is a group of artists who paint or draw in and around Victoria, B.C., Canada. Club members work in a variety of mediums including watercolour, acrylic, oil, colour pencil, ink and pastel. Studio 30 members display their work at shows in local shopping centres and other venues. The group enjoys a varied schedule of guest speakers and demonstrators for the meetings. Please browse the site for more information about the club and activities.